The DS may have been the first commercially successful touch-screen handheld games console, but touch screen devices are nothing new. Busy businessmen and geeks have been using touch screen portable computers, known as Personal Digital Assistants (PDA's) for many years. These devices run a wide range of productivity software (as well as the occasional game). Considering the success of the DS and its similarities to a PDA, it's surprising that non-gaming titles like Cooking Guide have not come along sooner. The consoles touch-screen functionality and its super-quick loading times make it a perfect fit for an interactive cookbook. So, is Cooking Guide the juicy morsel DS owning chefs have been waiting for? At Lets-Play-DS.com we donned our chefs hats and dodgy French accents and dived into the kitchen to find out. Cooking Guide is certainly well presented. From the main menu, you can dive straight into the "Cooking Guide", access the shopping list function or tweak some extra settings. The Cooking A-Z section is useful for cooking novices like myself. Opening this section of the software you can see explanations and tutorials on basic cooking procedures, ingredients, methods of preparation and utensils used. So, if you thought "Dariole mould" was something that grew in a damp cellar then you'll be pleased to learn that actually it's a bowl you use to make puddings, far more tasty. Moving on to the cooking guide itself, it is here you choose your recipe. You can search by ingredients or by country, keyword or difficulty. You can also save recipes to a favourites list. There are a whopping 245 recipes overall, which makes me feel a little uncultured that I struggled to find one that we had most of the ingredients for. The recipes are certainly varied and are selected from all over the world. If you plan on munching your way through them all, you'll be needing a very well stocked kitchen, or supermarket! After browsing through the recipes, we settled on a Turkish dish called Kuzu Guvec. This is a kind of lamb stew. By clicking on "view ingredients" in the overview screen, you can tick the ingredients you are missing for your next trip to the supermarket. You can do this for multiple recipes if you like. 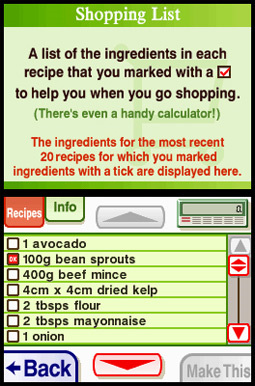 Then, when you go back to the main menu, entering shopping list mode shows a list of the ingredients you ticked. Take your DS with you to the store and tick them off as you find them. There's even a basic calculator on this screen too.